Robert L. Crutchfield, President and CEO of Christian City from 1993 to 2015, passed away September 20, 2017, following complications from ALS. Many who live and serve at Christian City know personally of Bob’s warmth and enthusiasm for the fellowship shared as “family” at Christian City. He was known as a man of both humility and integrity – born of a strong conviction of gratitude for what God had given him. “His highest aim for Christian City was the continuance of our ministry commitment and the spiritual well-being of our resident community,” Ryden said. In 2015, Crutchfield informed Christian City’s Board of Trustees, financial supporters, friends and residents of his ALS diagnosis, announcing that he would be retiring due to his declining health, and the search was underway for a new CEO to take over leadership of Christian City. Only three CEOs have served Christian City during the organization’s 52-year history. Crutchfield succeeded the non-profit’s first CEO, Bob Puckett. Upon Crutchfield’s retirement in December 2015, Len Romano became President and CEO of Christian City after a 36-year career with YMCA. “Bob’s legacy will live on at Christian City,” said Romano. “Despite his declining health, he worked tirelessly to facilitate a smooth transition when I assumed the CEO role almost two years ago. His dedication to the ministries was evident in his strong leadership. Bob left big shoes to fill, and I am honored to follow in his footsteps,” Romano said. Bob was the son of Brooks B. and E. P. Crutchfield. He was a lifelong resident of the Atlanta area where he attended East Atlanta High School and excelled in athletics. He married his high school sweetheart, Judi, in 1963. Bob was an excellent basketball player and played semi-professionally after attending Georgia State University where he received his BBA in 1971. He was a scratch golfer and founding member of Smoke Rise Golf Club. Upon graduation from college, Bob worked for LEAA and the Fish and Wildlife Administration to pursue his love of the outdoors. He received his real estate license in 1980. After having a distinguished commercial real estate career, he became President and CEO of Christian City in 1993 to fulfill a passion for helping others. Through his commitment to understanding that every person has a unique set of circumstances and needs regardless of their creed, Bob lived by the motto of “Above all else, never waiver from the fundamental calling to minister to the needs of our community in the name of Christ.” This unwavering pursuit changed the lives of hundreds of employees, children, residents, volunteers and supporters throughout his career. “Bob was a faithful servant leader,” said Philip Kouns, Chief Operating Officer of Christian City Children’s Village. “We will remember him as a strong, gifted and capable leader during the more than two decades he served as CEO. He demonstrated a genuine love and interest in caring for both the children and seniors living at Christian City,” Kouns said. Crutchfield, 74, died Tuesday, September 20, 2017, at Hospice Atlanta in Brookhaven. He leaves behind his loving wife of 54 years, Judith Wages Crutchfield, his sons, Robert Bryan (and wife Mathilde Tissot), Joel Keith, and his brother, James Kim. A memorial service was held September 24 at Smoke Rise Baptist Church. In lieu of flowers, Mr. Crutchfield requested donations be made to Christian City Children’s Village at www.christiancity.org/give. 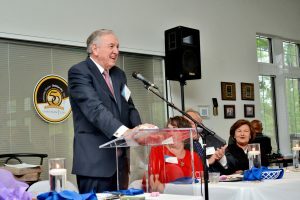 Bob Crutchfield, former President and CEO of Christian City, speaks at a retirement dinner held in his honor in 2015. Crutchfield passed away on September 20, 2017, following complications of ALS.